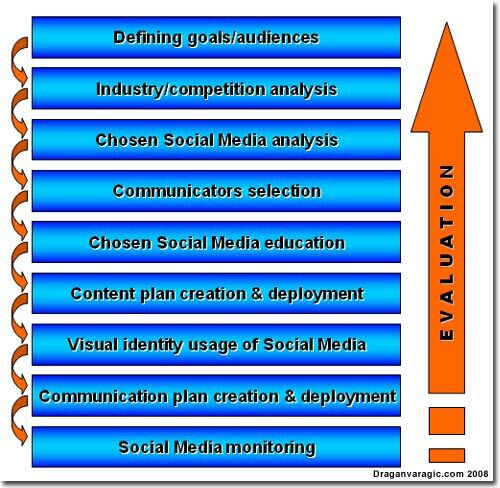 For the training and consulting business related to social media optimization (or company’s use of social media), it is very useful to have a framework (some people call it – success map) which defines general steps for the incorporation of a social media activities in the company’s business processes. After the development of the framework of a particular activities, it is much easier to create the detail map of the business processes and the responsibilities, needed to develop and maintain a social media activities within the company. I researched a number of proposed frameworks for social media (optimization), and I found several very useful works. Here is the review of nine proposed general frameworks for social media (social media frameworks taxonomy), and the tenth is my proposition for the subject (I already created SMO Matrix, but it is related to the brand reputation management). The details for the proposed frameworks can be found on the destination Websites. It is the recommendation to examine all the given slides at the destination Website. 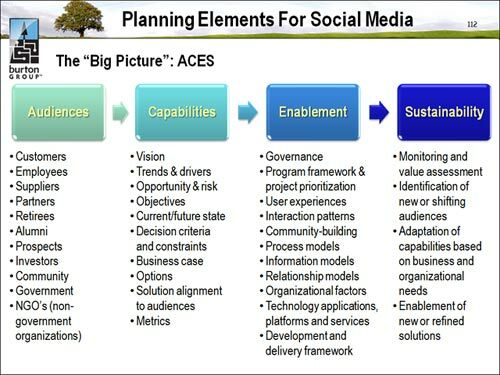 This framework is the structure of desirable goals related to social media activities. Those goals can be linked to the particular proposed features which are the representation of a social media activities. Setting social media campaign goals. Creating social media strategy/Defining promotion plan. Setting up customer’s profile on social media sites. Clearly articulate who your stakeholders are. Clearly articulate the key issues these stakeholders care about. Begin by researching which, if any, top bloggers are discussing these issues. Once your initial search yields important blogs, please visit them and note which social networks the bloggers use to connect (back channels). Identify the outcomes the organization would like to achieve. Identify the companyâ€™s value for the marketplace. Draft an editorial mission to serve the community/stakeholders. Determine who will create the content. Select general content categories to provide guidance on a weekly basis. How to engage the human resources of the company in social media landscape? Search Illustrated column @ SearchEngineLand. Defining the goals and the audiences. Identifying and researching the competition. The analysis of the chosen social media (conversation/content analysis). The selection of the communicators (the persons who will use particular social media). The education about the use of chosen social media. Content plan creation and the deployment for the particular social media. Visual identity usage, related to the rules of the particular social media. Communication plan creation and the deployment for the particular social media. Your SMO framework is spot on, but a word of caution: the social media landscape is moving too quickly for the old patterns of research and analysis. While it is important to be prudent, make sure you are agile enough to seize opportunity where you see it. Define your goals, analyze, educate, plan … but not at the pace you would in traditional media. Hope my framework was informative. Best of luck! Thank you for the inclusion in your research. very good post. I love the way how you put all this frameworks and methods together. It think your Framework is good, but rethink the evaluation. In most every case companys don’t want to reload the hole thing just to evaluate the revenue. Companys are driven by efficency and they don’t like to spend money on thinks they’ve already done, like the definition of goals.